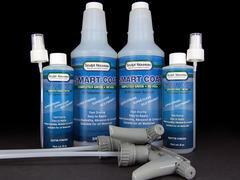 Smart Coat 1K is an easy to use urethane/resin sealant for all metal surfaces. Once dry, it forms a durable top coat that resists UV damage, humidity, abrasion, and corrosion. Smart Coat 1K has zero VOC, no odor, and is non-hazardous. It is terrific over polished metal, rust, and other patina finishes. It does not tend to change the color of a patina unlike solvent clear coats. It is best applied using a spray bottle. One gallon typically covers 250 square feet.